Save space in your wallet by digitizing the barcodes of any loyalty or memberships cards that you carry around. 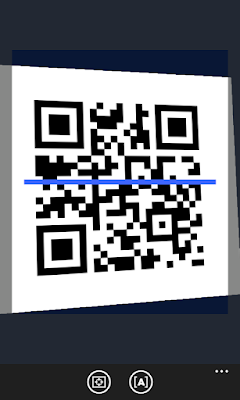 Tap a card to quickly bring up the barcode ready for scanning. Pin your most used cards to the start screen. 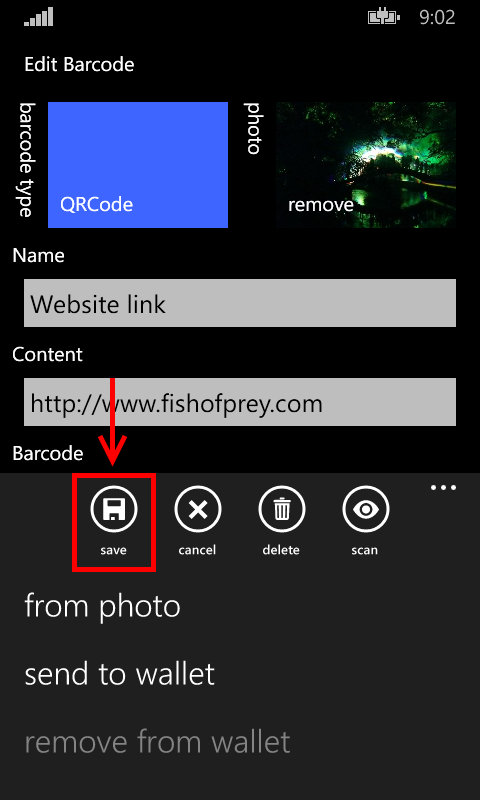 Scan a barcode directly from the phone from a video feed, photo, or saved image. 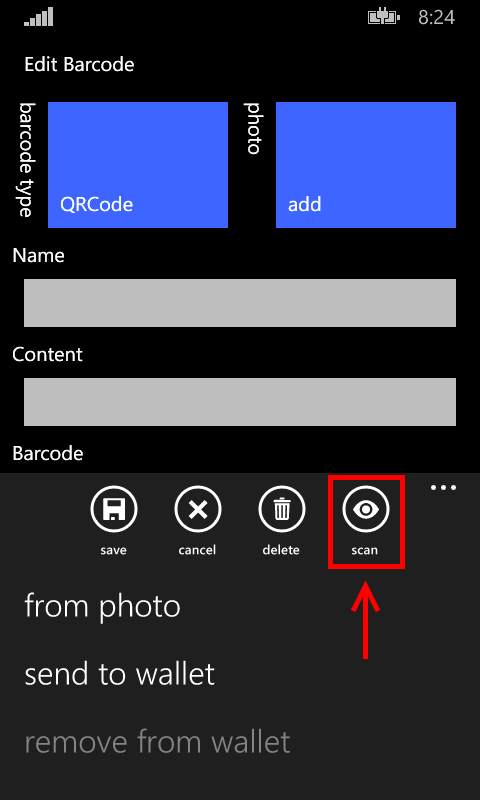 These are the basic steps to add a new barcode to the app by scanning it. Point the phones camera at the barcode. 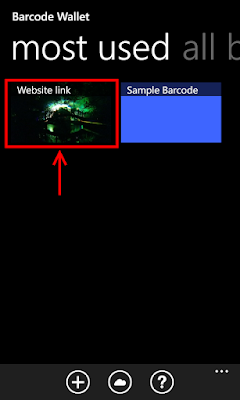 See scanning tips for further details on using the camera to capture the barcode. Optionally add a photo to identify the barcode using the add button next to the photo label. Select and crop the image. Check that the barcode format is supported by the app. 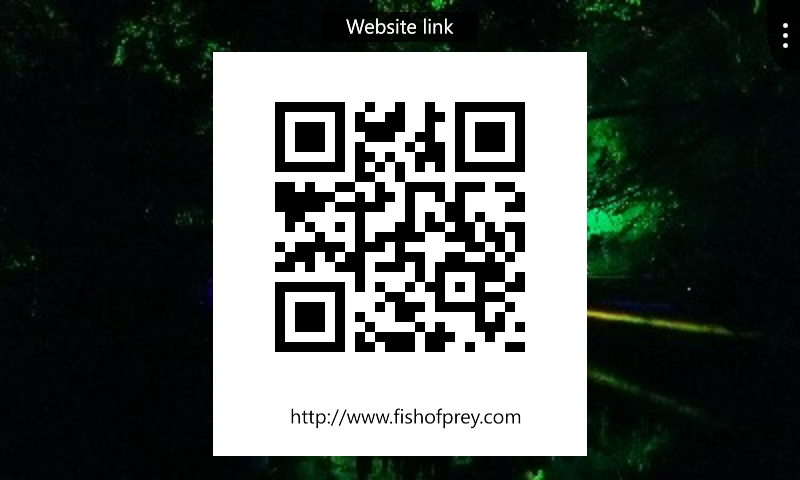 If you are having issues with a particular barcode try sending an image of it to an online reader. I've found the ClearImage Free Online Barcode Reader / Decoder to work well and provide back useful information, such as the barcode type as well as the data. Unfortunately not all types of barcode scanner are capable of reading barcodes directly from a cell phone screen. The major factor is the type of scanner being used. A laser scanner sends out beams of light and uses the reflected light to read the light and dark bars. White bars reflect back the majority of the light. Black bars absorb the majority of light and reflect back very little. Therein lies the issue for scanning a barcode from a cellphone screen. Firstly, The glass and other layers of a cellphone screen are more reflective than a printed barcode. The excess light they reflect back will prevent the scanner from clearly seeing the difference between light and dark portions of the barcode. Secondly, a cellphone screen does not appear white because it is reflecting light. Rather, it is emitting light from a number of other colours to create white (typically red, green and blue pixels). These multiple pixels emitting light together won't reflect light in the way that a printed white does. For these reasons a laser scanner cannot read a barcode from a phones screen. Another type of scanner is an imager or CCD Barcode scanner. These work more like a digital camera and will see the light emitted from the screen. CCD scanners can read a barcode from a cellphone screen. Can I scan barcodes directly from a cell phone or similar device? What is the difference between laser barcode scanners and imagers, also known as CCD barcode scanners? How do I delete a barcode from the wallet? On the first screen, try holding down on the barcode in question and then selecting edit. On the edit screen there will be a delete link in the application bar at the bottom of the screen. Scanning a PDF417 barcode produces the error "CP437 is not a supported encoding name. 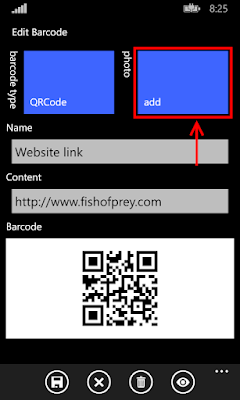 Parameter name: name"
Based on the error message it seems the barcode contains characters that aren't supported by the Windows Phone platform. Try manually creating the folder if the Onedrive permissions don't allow the app to. The folder should be called "Barcode Wallet" and be at the top level of the files directory. E.g. Unfortunately there in a known bug with v2.8.78 and 2.8.80. 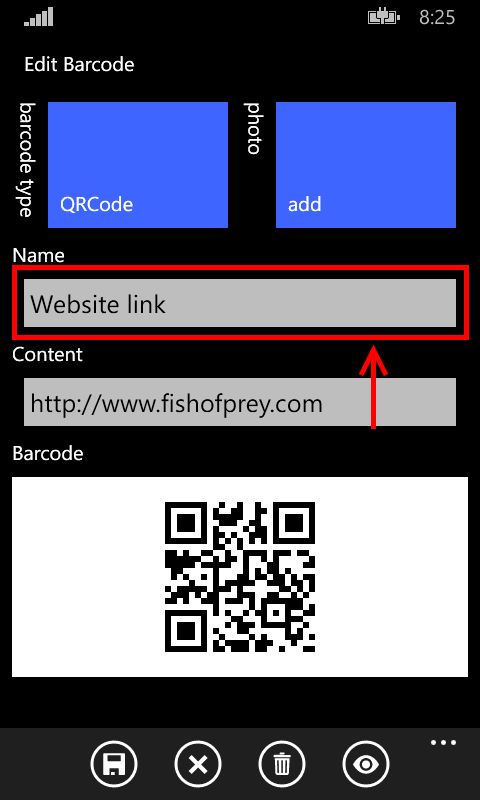 On WP7 and WP8 handsets there is a bug with the app bar focus button on the barcode scanning page. This prevents adjusting the focus to scan a barcode. Workaround: Half pressing the hardware camera button will also focus the camera. 8th June 2013 - I have resolved the bug and submitted v2.9.x to the store. It may take a few days for it to pass the store certification process. 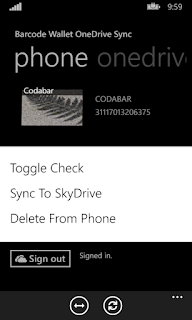 How do I sync barcodes to Onedrive from the phone? 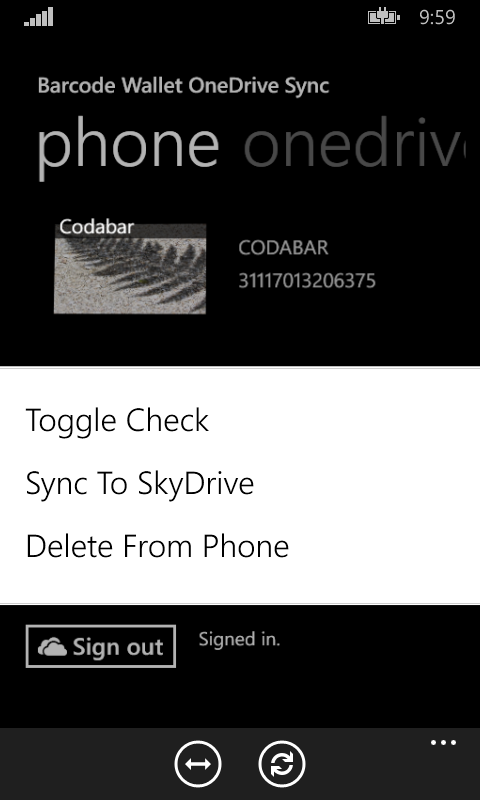 From the "Barcode Wallet Onedrive Sync" page (accessed via the cloud button in the app bar). 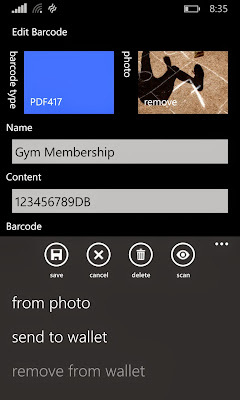 Press and hold on the barcode you want to sync to Onedrive. An option should appear to transfer it. Alternatively, tap to the left of a barcode to check it. Then use the "sync" command to transfer all the checked barcodes. 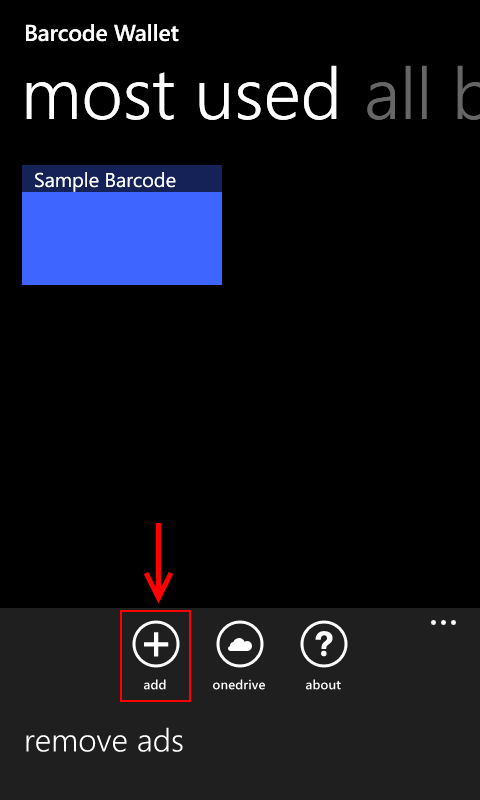 Pressing "sync" with no selections will give the option of transferring all the barcodes. If you select Onedrive rather than phone the sync direction is reversed. How do I sync barcodes to the native Wallet app? Wallet integration is currently supported from the barcode edit page. Expand out the application bar and select "send to wallet". Having trouble with a PDF417 file. Wouldn't read it so I sent it over to the online reader you suggested—I put the parsed string into the barcode field and then started getting this error: "'CP437' is not a supported encoding name. Parameter name: name"
Also, some pie-in-the-sky ideas... and I realize this is free software—a wonderful gem (thank you)! Suggestion: Let us also take and store a picture of the back of the card. 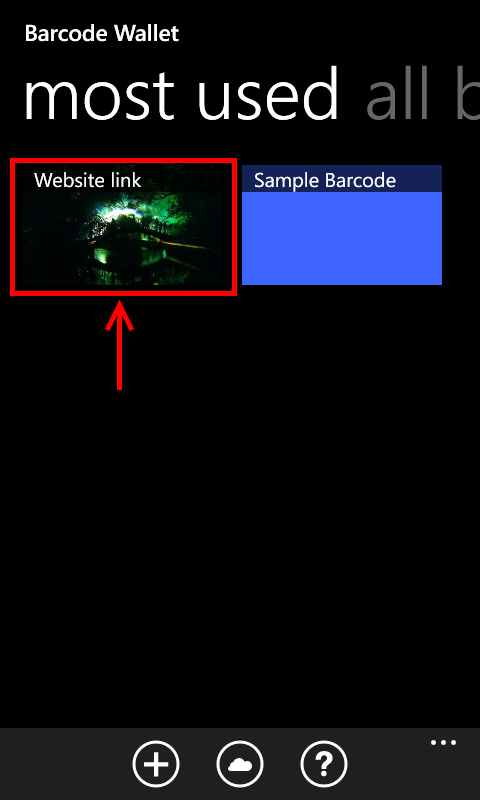 Then, when viewing a card, have the ability to swipe between generated-barcode view, front image, and rear image. Suggestion: being able to rotate the image in addition to cropping would be very helpful! Suggestion: Make the list under "All Barcodes" look the same as the list under "Most Used". On both lists, instead of the code to the right of the card image, just make two columns of cards (the title overlay already works beautifully). Suggestion: Add some type of sharing (tap to send!) so that you can share your card with someone else. Would be awesome to be able to set up a new card and then just tap it over to my wife's phone. Suggestion: backups... Skydrive? Dropbox? Entering all those cards is pain! Oh... one more suggestion... Crop instead of squish the images. For pinned tiles etc., instead of resizing the photo to fit in the tiles, scale the card image to match the hight, then center (or even left-justify) horizontally. This will likely look better than distorting the image. Thanks for the suggestions. I'll add them to the list of possible future developments. I am only getting 4 entries to save. When I exit the app and go back, only 4 are retrieved. The default view when the app starts is to show the four most used barcodes. If you swipe to the left or right you will see the rest. Hi, I'm not sure I follow what you are attempting to do. Are you scanning barcodes from hot wheel cars? Barcode wallet doesn't have direct integration with any third party services other than skydrive. Just input my cards but unable to delete entries by either holding on entry and pressing delete option or tapping entry and pressing trash can. Entries wiggle as to show they've been touched, but item not removed. Can't wait to try your app in the stores. One suggestion is to make categories with nice icons to quickly find a card. That is very odd behaviour. I haven't had any other reports of not being able to delete barcodes. It is possible that your database has become corrupted. If that is the case the simplest option would to to uninstall and re-install the app. You can backup the barcodes to Skydrive first if required. If an error is reported when attempting to delete the records please send it through to me. But I have a problem with a barcode. It is an 18 digits long ITF code. Your app can scan it in the right way and also shows the correct digits in the content field. But it can not render an barcode image because it autoselects ITF14 as barcode type. 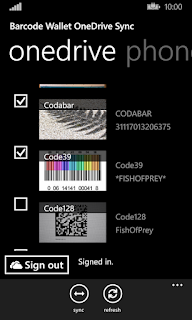 Is there a possibility to get a barcode image in the barcode area? 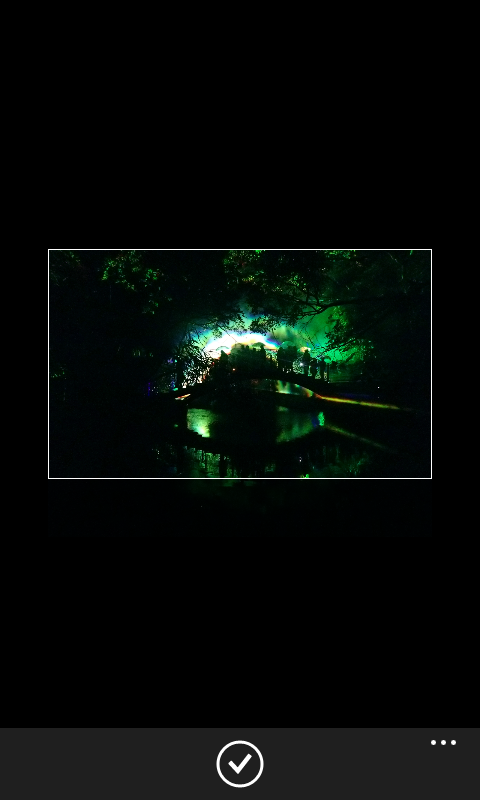 For example as image taken by camera if the app is not possible to create an image? 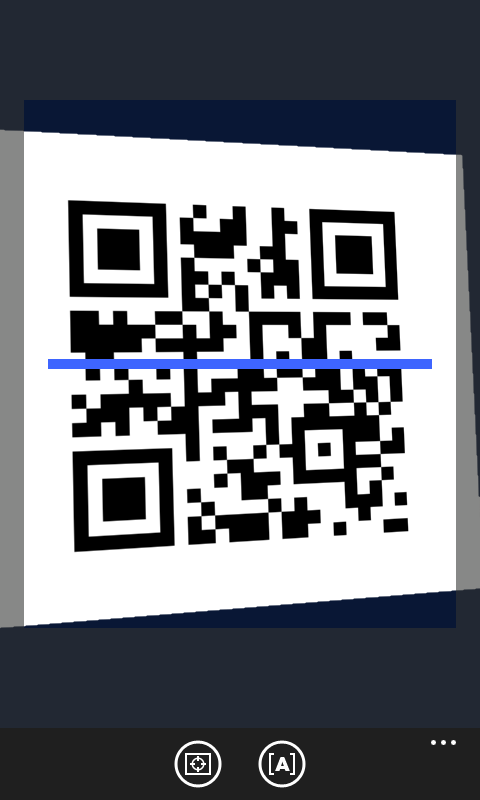 Are you able to provide the contents of the barcode or email an image of it to me via the support link in the app? I'll look at adding straight image support to the app. I've downloaded it and as a stand alone app it works great. 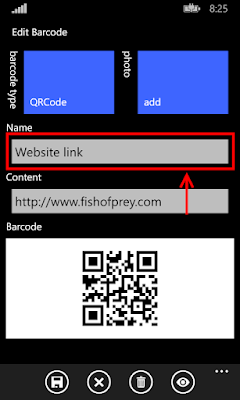 I want to incorporate it into my Wallet app on my windows phone, but it doesn't seem to recognize it. Is it compatible? I would like to be able to delete/add/sort barcodes in the Most Used list. 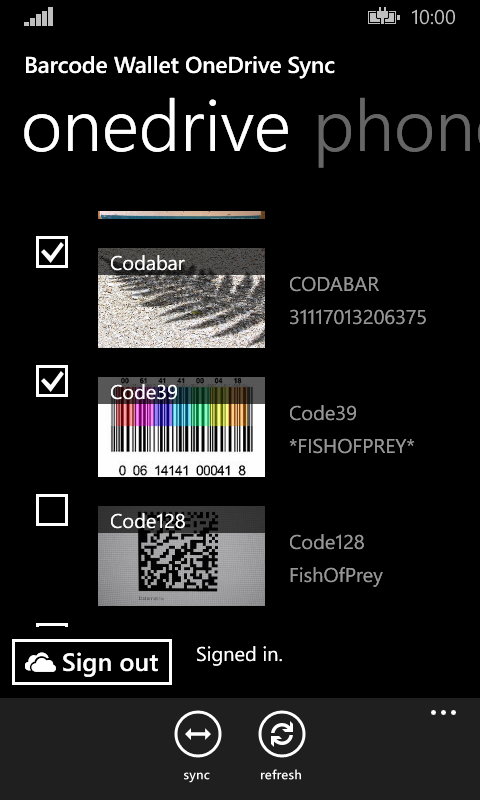 App sometimes spontaneously removes or rearranges barcodes in the Most Used list. Thanks for the feedback. I've added that as a potential future improvement. Note that I'm not actively updating my Windows Phone apps at the moment due to the lack of momentum from Microsoft in supporting the platform.